Wahazar wrote: After accident with trireme caused by silly isometric aspect ratio, I definitely switched to rounded square overhead tileset for LT. I'm not quite convinced with these pixels instead of numbers, but generally it looks fine. Maybe wall merlons (as it was in cov1) instead of these small, hard to notice yellow flags, for non-empty town? The yield-dots may grow on you. The cities and their occupancy indicators are pure default Trident. I fully intend to revamp them at some point. I agree it is far harder than it needs to be to see if they are occupied or not. Hans Lemurson wrote: The cities and their occupancy indicators are pure default Trident. I know, but while other things are more clear now if compared to default trident, city occupancy is still illegible. Consider it a feature request. 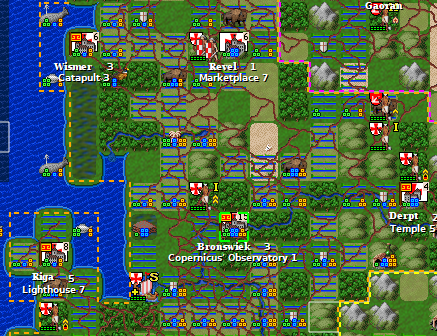 Having converted several otherwise productive hours of the day into tinkering with FreeCiv graphics, I present the following enhancements to the tileset: Better Occupancy Flags! To use these alternate graphics, modify the "RoundSquare.tilespec" file, look for line 65 and follow instructions. ; "RoundSquare/yields_f.spec", ;Optional Full-Food yield graphics. Uncomment to activate. Now, you would think that all this wouldn't have taken 2+ hours to accomplish, but you would be wrong. I went through MANY potential flag/occupancy graphics, drawing, redrawing, and erasing before settling on one that did a decent job of "catching the eye" without covering up or blending into or otherwise disrupting other graphics. Well done, definitely hard to overlook, even if city background flag have similar colours. I'm not 100% sure what the emblem on the flag is supposed to represent (balance scales? ), but it is nice and distinctive. Visible even against the flags of Spain and Catalunia. I can see it as a separate "thing" even when squinting, and it can't be confused with any other feature on the screen. And so I decided it was "good enough". -Touched up the LT Flagship graphics a bit. Looks properly fancy now. -Modified the Fanatics graphic to look more plausible as a rifle-era unit. Looks properly mujehadeen now. -Tweaked the shading a bit on the Farmland graphic. Version 0.42 can be installed by pasting http://student.ulb.ac.be/~lmoureau/freeciv/RoundSquare-0.42.modpack in the URL field of the modpack installer and clicking Install. louis94 wrote: Version 0.42 can be installed by pasting http://student.ulb.ac.be/~lmoureau/freeciv/RoundSquare-0.42.modpack in the URL field of the modpack installer and clicking Install. That sounds like a great idea. How do I do that? along with Foobar. If not, see <https://www.gnu.org/licenses/>.